Remote Access Server over IP™ (RASoIP™) is a remote modem gateway or aggregator which provides a machine-to-machine (M2M) communications solution to replace conventional MoIP services. 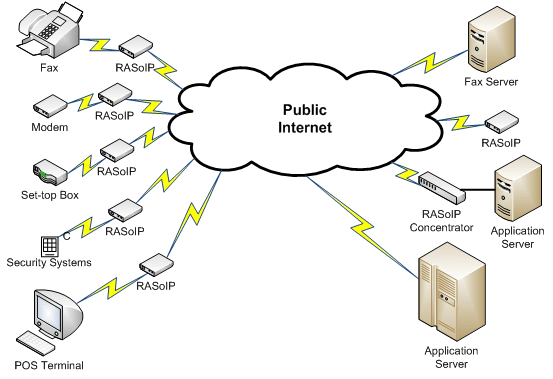 RASoIP distributes the concept of Remote Access Servers (RAS) into local networked ATA devices, each with a full set of data modem protocols to extract modem information at the source. It replaces a dial-up remote server gateway and eliminates the banks of modem servers at the ASP. RASoIP delivers modem data over the Internet and other IP networks in a variety of forms including Telnet and RFC 5194 Framework for Real-Time Text over IP. Data from legacy dial up modems may be aggregated by RASoIP and also transmitted using IP protocols over mobile, radio and satellite (Iridium, etc) links. VOCAL’s software libraries are optimized for performance on ANSI C and leading DSP architectures from TI, ADI, ARM, Intel and other vendors. Contact us for a demo and to discuss your specific Remote Access Server development requirements. Fax services (transmit and receive) may be directly handled by a Distributed Remote Gateway over IP™ (RGoIP™), or Distributed Gateway over IP™ (DGoIP™), which provides both data and fax modem services directly in a customer’s ATA VoIP device. In this model, remote equipment controls the customer’s distributed modem using ordinary AT commands. Standard fax applications may be used by a fax server to send and receive faxes. Special buffering, command anticipation and keep alive methods are employed within the ATA to ensure high reliability of modem operations. VOCAL’s VoIP Software Suite provides developers a robust and comprehensive set of software libraries to create a complete RAS over IP solution to implement a remote modem gateway or aggregator across a wide variety of platforms. The modem aggregator software is fully integrated and highly configurable, including a Network Stack, SIP Stack, full-featured Telephony software, as well as a wide range of audio codecs. Additional information regarding all aspects of our RAS over IP software solution is available. VOCAL’s software is available for the following platforms. Please contact us for specific RASoIP software supported platforms.